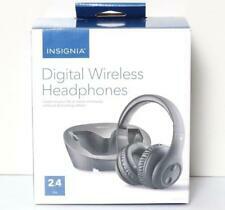 INSIGNIA Digital Wireless Headphones for TV & Audio Devices NS-WHP314 SR.
Color Boysenberry. Manufacturer Color Boysenberry. Type Portable Speaker System. Wireless Technology Bluetooth. Bluetooth Plus an integrated power bank for charging compatible devices. To Fit Speaker. Trending at $15.65eBay determines this price through a machine learned model of the product's sale prices within the last 90 days. Built-in microphone to make phone calls. Compatible with any Bluetooth device or any device featuring a 3.5mm aux port. Our main warehouse is located right outside of Baltimore, Maryland. Smart Watches. This is a Insignia NS-CAHBTEB02-BLK Bluetooth In-Ear Headphones Headband Black. Enjoy up to eight hours of your favorite music with these Insignia Bluetooth headphones. These Insignia Bluetooth headphones have retractable earbuds for neat storage. Insignia NS-CAHBTEBNC-B. Enables simple wireless pairing with your Bluetooth-enabled device. Ditch the headphone cable with these Insignia Bluetooth wireless earbuds. These Insignia Bluetooth wireless earbuds feature a built-in microphone for hands-free calling and easy voice commands. Truly-wireless headphones. (Pair of 2 ) Insignia Portable Wireless Bluetooth Speakers Blue Color. Good Condition. Only speakers included. We will work with you to resolve any issues. Insignia - NS-HAWHP2 RF Wireless Over-the-Ear Headphones - Black. Over-the-ear headphones with adjustable headband: Provide comfort during extended listening sessions. Wireless ConnectivityRadio Frequency (RF). There is nothing broken or missing for this item. There are no sign of use. This item is 100% new condition. B. Not Included: Nothing missing. We are Lucy's Strawberry Fields. We never compromise on quality, period. Trending at $9.05eBay determines this price through a machine learned model of the product's sale prices within the last 90 days. LIKE NEW IN OPEN BOX. The box is distressed. Insignia True Wireless In-Ear Headphones Stereo Earbuds Black USED ! 4 out of 5 stars - Insignia True Wireless In-Ear Headphones Stereo Earbuds Black USED ! 4 product ratings4 product ratings - Insignia True Wireless In-Ear Headphones Stereo Earbuds Black USED ! This Insignia portable Bluetooth speaker. This Insignia portable Bluetooth speaker is compact and lightweight, making it great for use during travel. Make: Insignia. Connectivity Interfaces: Bluetooth. Only the headset. -Signature Maybe Required. Trending at $12.97eBay determines this price through a machine learned model of the product's sale prices within the last 90 days. INCLUDED - Headphones, AUX Cable, USB Cable, Original Box. These Insignia Bluetooth wireless earbuds feature a built-in microphone for hands-free calling and easy voice commands. Insignia NS-CAHBTAP in-Ear Headphones. Truly-wireless headphones. 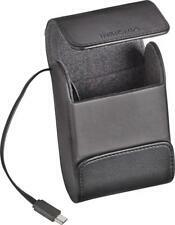 Enables simple wireless pairing with your Bluetooth-enabled device. Well its simple! Excellent condition. Misunderstanding of the functionality. Headphone Fit. Listen to your TV or music wirelessly without disturbing others. Wireless Connectivity. Radio Frequency (RF). Sound Isolating. Charging Accessory Included. Battery Life. Adjustable Headband. Custom Bundle: No Earpiece Design: Earbud (In Ear). Open Box, in grade A Condition like New. Sony PlayStation 4 Over-Ear Wireless Headset - PlatinumBlack/Silver CECHYA-0090. Samsung Gear Sport Hybrid Band 44.6mm Case Classic Buckle Black Blue SM-R600 R7. Tackle your daily exercise routine while listening to inspiring songs with these Insignia Bluetooth headphones. Featuring echo cancellation and noise suppression, these Insignia Bluetooth headphones provide stunning sound clarity. Break free from cords and wires with these Insignia wireless on-ear headphones. Echo cancellation and noise suppression technology ensure your music is heard loud and clear, and the sweatproof pads make these ideal for use at the gym. Make hands-free phone calls and listen to your favorite music with this Insignia portable Bluetooth speaker. This Insignia portable Bluetooth speaker is compact and lightweight, making it great for use during travel. Insignia 2.4GHz Digital Over-the-Ear Wireless Headphones (Black) NS-WHP314! Open Box, Like New Condition! 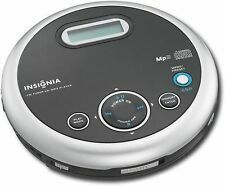 Works with all your audio components (TV, CD/DVD Player, MP3 Player.). String 2.4 GHz digital wireless signal - 49.2 ft (15 m) wireless range (maximum, line-of-sight). Listen to your TV or music wirelessly without disturbing others. 4.5 out of 5 stars - Insignia 2.4GHz Digital Over-the-Ear Wireless Headphones (Black) NS-WHP314! 571 product ratings571 product ratings - Insignia 2.4GHz Digital Over-the-Ear Wireless Headphones (Black) NS-WHP314! 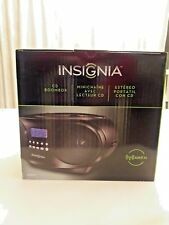 Insignia NS-SPBTWAVE2-BK Portable Bluetooth Speaker (BLACK) - New. Shipped with USPS Priority Mail. Insignia Wireless Over-the-Ear Headphone - Black - by Insignia Wireless. Walk around while you listen with these Insignia over-the-ear Bluetooth headphones. Does the device have a clean ESN?. Elkridge, MD. 1 x Aerial Antenna. Give us a chance to get problem solved Friendly. Your cooperation will be highly appreciated. SKU # : A99. Included: Speaker, USB, Original Box. ( Box is Distressed from Transportation and Handling). New Open Box! Color: Black. Condition: This item is NEW IN BOX condition. There are no sign of use. This item is 100% new condition. The photos are taken on actual item on sale. Insignia NS-CAHBTEBNC-S Headphones. Bluetooth interface: Enables simple wireless pairing with your Bluetooth-enabled device. In-ear design: Fits securely and directs music into your ears for full, uninterrupted audio. Enjoy up to eight hours of your favorite music with these Insignia Bluetooth headphones. These Insignia Bluetooth headphones have retractable earbuds for neat storage. Enables simple wireless pairing with your Bluetooth-enabled device. Share music wirelessly with your friends when you pair this Insignia black Bluetooth speaker with your smart device. Use the unit's built-in speakerphone feature to make and answer calls via your connected phone and stay in touch on the go. SPEAKER IS IN EXCELLENT CONDITION. THE ORIGINAL BOXES WILL HAVE WEAR AND TEAR THE SPEAKERS ARE PERFECT. Trending at $4.90eBay determines this price through a machine learned model of the product's sale prices within the last 90 days. May have 1 or 2 minor scratches. 1x Micro USB Charging Cable. Trending at $10.95eBay determines this price through a machine learned model of the product's sale prices within the last 90 days. Lot Of 2 Insignia Portable Bluetooth Stereo Speaker Camouflage Camo SEALED !!! Lot Of 2 Insignia Portable Bluetooth Stereo Speaker. Very Clean and Fully Functional. Outer shell will show wear. 5 out of 5 stars - Lot Of 2 Insignia Portable Bluetooth Stereo Speaker Camouflage Camo SEALED !!! 8 product ratings8 product ratings - Lot Of 2 Insignia Portable Bluetooth Stereo Speaker Camouflage Camo SEALED !!! Over-the-ear headphones with adjustable headband:Provide comfort during extended listening sessions. 5.8GHz digital wireless signal:Transmits high-quality audio from up to 33'. Wireless Connectivity Radio Frequency (RF). 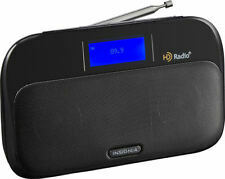 Choose this Insignia HD tabletop radio to access a variety of HD programming. This compact digital radio fits well on a slim shelf or tabletop, and its 3.5mm jacks let you connect headphones or other audio devices. Color: Black. Condition: This item is NEW IN BOX condition. There is nothing broken or missing for this item. There are no sign of use. This item is 100% new condition.